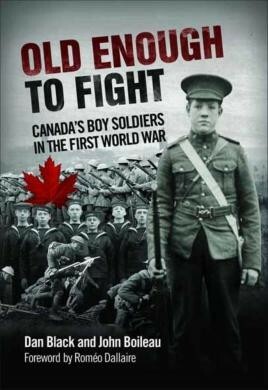 Between 15,000 and 20,000 underage youths, some as young as ten, signed up to fight in Canada's armed forces in the First World War. They served in the trenches alongside their elders, and fought in all the major battles: Ypres, the Somme, Passchendaele, Vimy Ridge, and the rest. Many were injured or suffered psychological wounds. Many died. Between 15,000 and 20,000 underage youths, some as young as ten, signed up to fight in Canada's armed forces in the First World War. They served in the trenches alongside their elders, and fought in all the major battles: Ypres, the Somme, Passchendaele, Vimy Ridge, and the rest. Many were injured or suffered psychological wounds. Many died. This is the first book to tell their story. Some boys joined up to escape unhappy homes and workplaces. Others went with their parents' blessing, carrying letters from fathers and mothers asking the recruiters to take their eager sons. The romantic notion of a short, victorious campaign was wiped out the second these boys arrived on the Western Front. The authors, who narrate the fighting with both military professionalism and humanity, portray many boys who, in the heat of battle, made a seamless transition from follower to leader to hero. Authors Dan Black and John Boileau combed the archives and collections to bring these stories to life. Passages from letters the boy soldiers wrote home reveal the range of emotions and experiences they underwent, from the humorous to the unspeakably horrible. Their parents' letters touch us with their concern, love, uncertainty, and often, grief. Meticulously researched and abundantly illustrated with photographs, paintings, and a collection of specially commissioned maps, Old Enough to Fight is military and social history at its most fascinating.